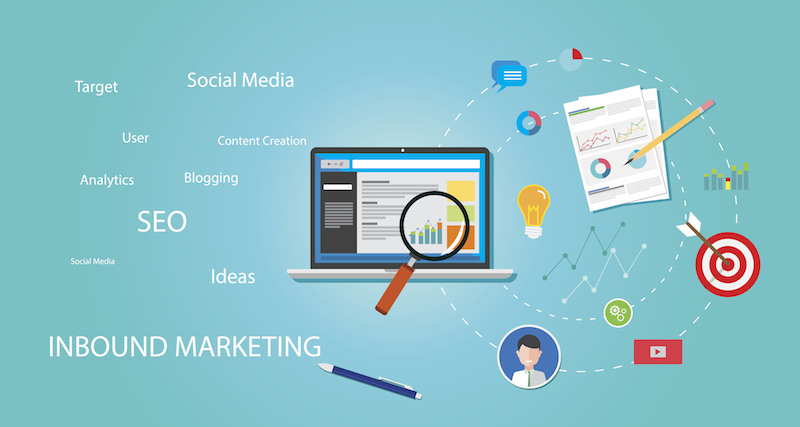 ‘Inbound marketing’ comprises a core base of marketing activities that result in a positive and constructive buyer’s journey. The buyer’s journey is the act of turning complete strangers into paying customers and even self-promoters. People will not inherently like or trust you, so giving them a reason to is important. If you get your inbound marketing right, they will see you as an industry leader, trust you, and that will help to meet your top business priorities. • Across a range of marketing budgets, companies experienced an average of 48% more ROI with inbound as compared to more traditional (outbound) marketing investments. • Companies with a budget of less than $100K are four times more likely to implement an inbound vs. outbound strategy (due to the compelling ROI benefits). • Companies are three times more likely to see a return on inbound than outbound. Using Inbound you target the right people at the right time for maximum Return On Investment (ROI). The vast majority of inbound marketing is done online. Inbound works to attract buyers when they’re already showing interest in your product or service. Buyers who give indications of interest are much more likely to convert and purchase. Inbound marketing costs 62% less than traditional marketing, yet every pound spent on inbound generates three times as many leads as traditional. In this blog we will consider content marketing for manufacturers. In future blogs, we will consider the other four key elements of inbound marketing that manufacturers are gaining success through. With every brand, raising awareness about the company’s key products and services is key. In order for the manufacturing industry to thrive and develop a wider audience reach, investing time into generating compelling content is essential. It can improve your authority within the industry, increase your thought leadership and improve your business’s customer loyalty – all helping you become the market leader. • What are potential clients looking for? • What could make their lives easier? • What problems can you solve? • What can you do that could make them money? By answering these questions, you should be able to see how your answers correspond to your goals. People use search engines to find solutions to problems. If you can identify these problems, you can position your content as the solution. Talk to your employees. They know the technical bits, the innovative bits, the bits that make people say yes to a sale. Get them involved in your content planning. Hold a brainstorming meeting. They are probably not the people you should get to see the content through to fruition, but they are the people who can provide you with the seeds of ideas. Why reinvent the wheel? Start with what you’ve got! Begin by taking an inventory of your current content to help you identify the materials you have in stock vs. new materials you might want to develop in the future. Many times an older piece of content can be repurposed with some minor copy and design revisions. Repurposing your inventory will not only help you save the time and expense of creating all new content, but can also help you gain traction quickly. What is your competition saying in their content marketing.? Are they successful in their efforts – or missing the mark? Evaluating the competition can help you solidify and differentiate your company from the rest of the pack. A classic choice for content marketers, blogging remains an enduringly popular strategy. Why? It is cost-effective and it works. By including a blog on your website, the search engines are continually being fed fresh, relevant content (which they love). Blogging also encourages loyalty. When people are returning week on week to read your content, who do you think they will come to when they want to make a purchase? Ideally you should be blogging at least one to two times a week, so a good strategy is to create an editorial calendar. Think about what events map out the manufacturing year. Google Trends is a great way to see what’s popular when. Products are at the heart of manufacturing. Your products solve other people’s problems, which makes video one of the best ways to showcase your skill, innovation, and quality. YouTube is a free service, which allows you to publish videos on their site, while simultaneously embedding them on your own. By making your titles and descriptions keyword rich, it is also possible your video will appear in the search results. Show people what they are missing out on. Another popular form of visual content is the infographic. Infographics are a great way to visualise stories or trends through the use of imagery. By curating facts about your industry, you can create something that is really engaging, something that your customers may want to share with their customers. It is important to make it easy for people to share what you’ve made. By including social media buttons at the top and bottom of your content, you can encourage social shares onto the network of their choice, e.g. LinkedIn, Twitter, Facebook, etc. If you have created an infographic or video, providing an embed code will encourage people to post it on their blogs too. 7. Tell your audience what to do next! Always use an explicit Call-to-Action. Tell your prospect what to do next! Otherwise, they’ll most likely read your content and then leave. If there is a next step, or a related resource, point them in the right direction on your website. Many larger manufacturers have their own sizable marketing teams, however most small to medium sized manufacturers simple can’t justify this. As a result it may make sense to outsource your marketing function to GetSet Midlands who understand the requirements of the manufacturing industry.